Get into the Chirstmas Spirit and celebrate in style with this winter wonderland mixed Christmas wrapping paper set. 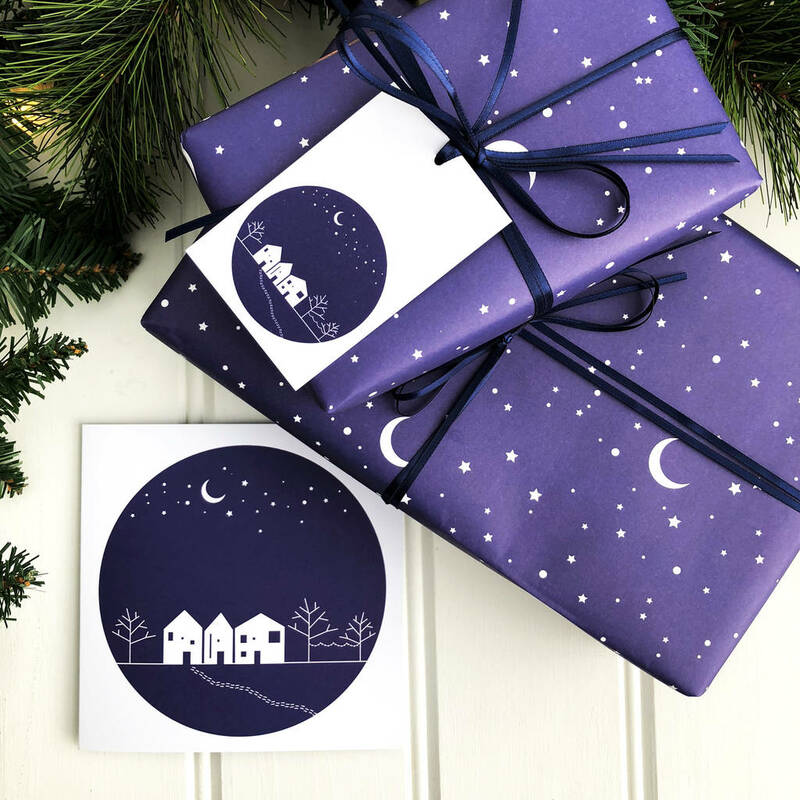 This winter scene Christmas gift wrap will take pride of place under any Christmas tree and will really help you ensure that your gifts stand out from the crowd. 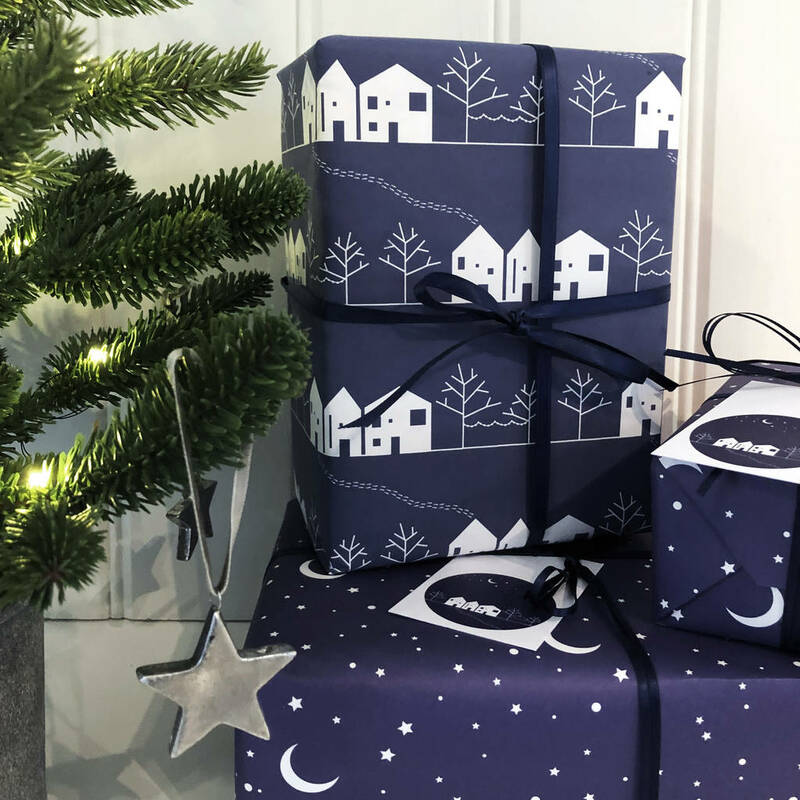 What better way to celebrate one of the most magical times of the year than with our winter scene Christmas gift wrap set. Each row of tiny white houses has been carefully positioned to ensure the design is equally suited to both larger and smaller gifts. It is suitable for both male and female recipients and would also be a lovely option for a new baby celebrating their first Christmas. 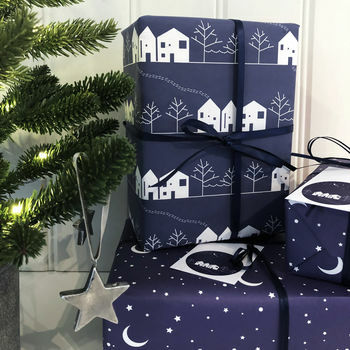 This scandi-inspired Christmas gift wrap is printed on a luxurious navy matt paper stock and supplied with our winter scene gift tags. It is available in sets of two sheets with two tags, a set of four sheets with four tags or a set of ten sheets with ten tags. Additional gift tags, satin ribbon and matching Christmas cards are also available. This mixed pack of christmas gift wrap contains both our new winter designs - stars and moons and winter scene Christmas wrapping paper. Is the perfect choice for giving your Christmas gifts a contemporary feel. Mixed Christmas wrapping paper packs are available with 4 sheets (2 sheets of stars and moons and 2 sheets of winter houses), 8 sheets (4 sheets of stars and moons and 4 sheets of winter houses), 12 sheets (6 sheets of stars and moons and 6 sheets of winter houses), or 20 sheets (10 sheets of stars and moons and 10 sheets of winter houses). Additional gift tags, matching christmas cards and navy satin ribbon are also available. Christmas cards are printed on a matt fsc certified card stock and are blank inside. This product is dispatched to you by Studio 9 Ltd.